Click here for more photo of students' work.
" Roy has knowledge that is truly deep and he is more than willing to share it. I came away awash with ideas, suggestions and some detailed understanding, that continues to surprise me. I was most compelled by his innovations and his use of traditional practices but with a huge emphasis on locally sourced woods. To innovate, within traditional boundaries, I find most compelling. I felt a subtle, but strong, nudge in my thinking and direction. I came away with a changed view as a guitar maker. Most of all I had fun, learnt a lot and spent a good deal of time with a guitar making giant. " For many people, the fascination of making a guitar is due to it being a combination of honing your woodworking skills, combined with the ongoing quest to get the best tonal results possible from the wooden structure you are building. This dual aspect means that during your course, we make time to focus both on developing an eye for extremely accurate woodworking, together with considering how and why the wood behaves as it does; we go into the various mainstream guitar designs as well as discussing the merits or otherwise of more recent developments with strutting layouts and alternative kinds of wood. As far as developing skill and confidence in the use of tools goes, it soon becomes clear that guitar making does not actually use a lot of difficult, traditional cabinet-making joints; although the traditional Spanish neck-to-body join is complicated, for the most part the guitar consists of one flat surface glued against another. A lot of practice with hand tools is needed to achieve perfectly fitting surfaces, which are important not only for aesthetic reasons, but to avoid building unwanted stresses into the instrument. Learning to control planes and chisels takes time, with the realisation that it may sometimes simply be one more wafer-thin shaving that is all that's needed to obtain that elusive, prefect fit. The course will provide lots of opportunity to hone your skills. 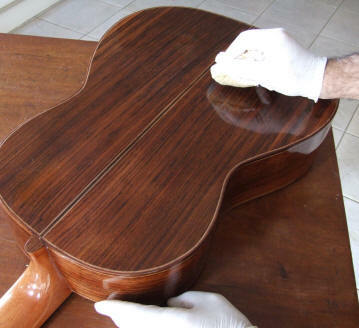 If time allows, you will also be taught French polishing, the ideal way to finish a top quality classical guitar. As well as using conventional woodworking tools such as planes, chisels and saws, you will also become familiar with the guitar maker's special tools; bending irons, cabinet scrapers, purfling markers and cutters, circle cutters, dial calipers and thumb planes. 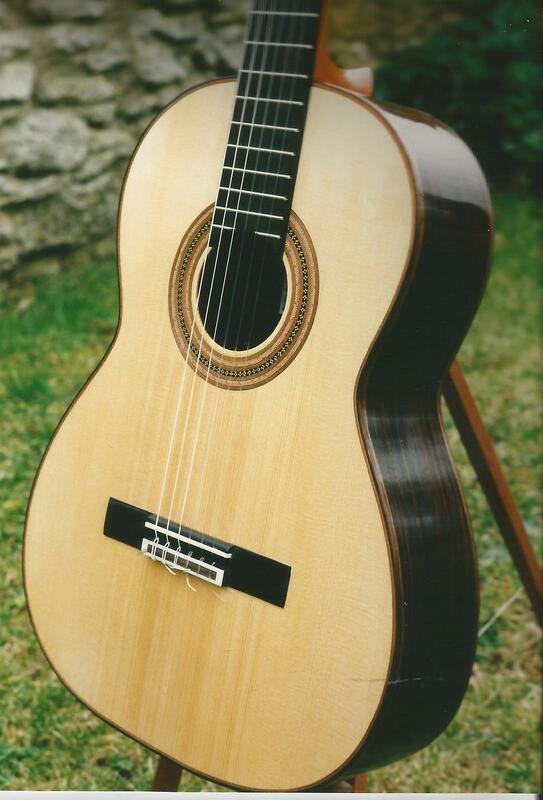 You may want to first make a generic classical guitar, but it is more interesting to build a guitar based on one of the famous luthiers of the past; - we have detailed working drawings of guitars by Antonio de Torres, Hermann Hauser, Ignacio Fleta, Robert Bouchet, Santos Hernandez, Jose Romanillos and Daniel Friederich, as well as drawings for lattice guitars and guitars with non-conventional sound hole positions. If you are starting on your first guitar, we will suggest the most suitable design, depending on your existing skills and also the tonal outcome you are aiming for. Our one-to-one teaching method means that you will have lots of space to spread out your work; the workshop has well-lit benches around three sides of the room. Every tool and technique is clearly explained and demonstrated before you jump in and start, as as soon as a question arises, the tutor is there is help you through to a solution. 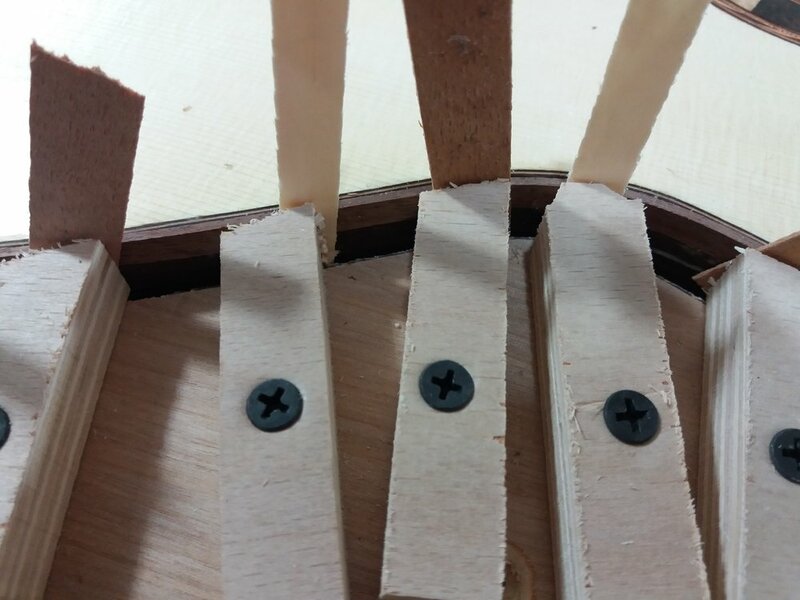 Some people manage to make a guitar from scratch in four weeks, but if you want to make your own work boards and jigs as well, a realistic time scale is much longer. We have students who come for a week, then carry on at home, and return later for more time as needed. But if you are travelling far, then a longer block of time is more productive.